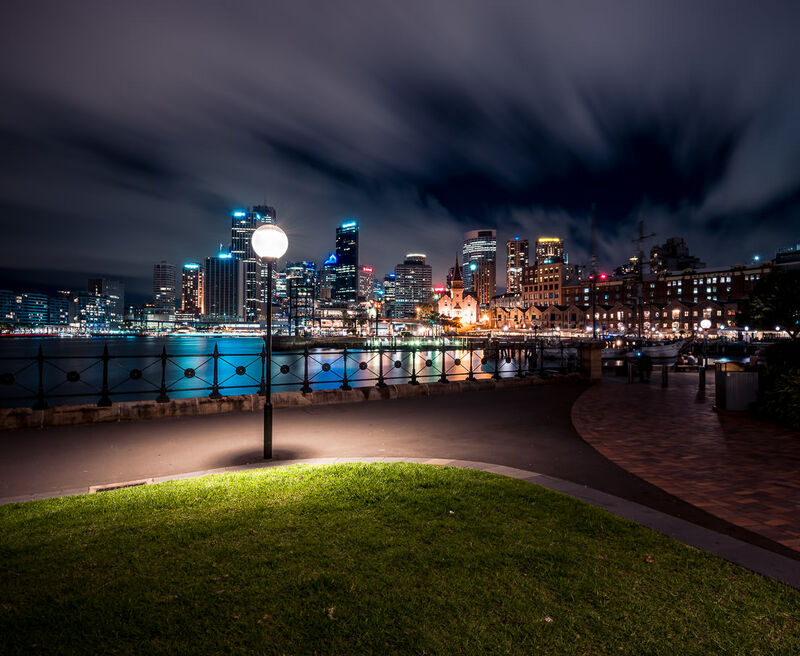 Directions: From Circular Quay, walk past the International Ferry Terminal along Circular Quay W. At the roundabout, follow along the water past the Park Hyatt hotel. Hickson Road Reserve is a small spot of land just on the east side of Dawes Point under the south pylon of the Sydney Harbour Bridge. 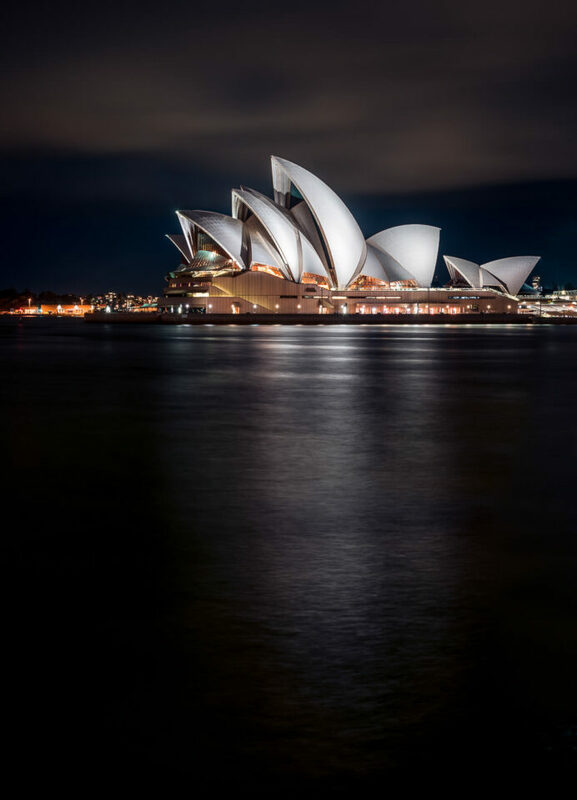 It has a spectacular, and unobstructed, view of the Sydney Opera House, and is a great vantage point for photographing the Harbour Bridge, and the downtown central business district of Sydney. The space is just far enough from Circular Quay that you’re likely not going to find a huge crowd of tourists, but it’s easily accessible by foot. There are often outdoor weddings here, but the sidewalk around the reserve should remain open. After photographing the downtown skyline and Opera House, turn around to capture the Harbour Bridge. Visit anytime, but the best photo opportunities are likely at sunset or after dark. Sunrise would also provide some great light and a unique look at the city waking up. There are a few parking spots nearby, as long as a wedding or other special even isn’t taking place. Still, the easiest access is by foot. Bring a tripod for long nighttime exposures. 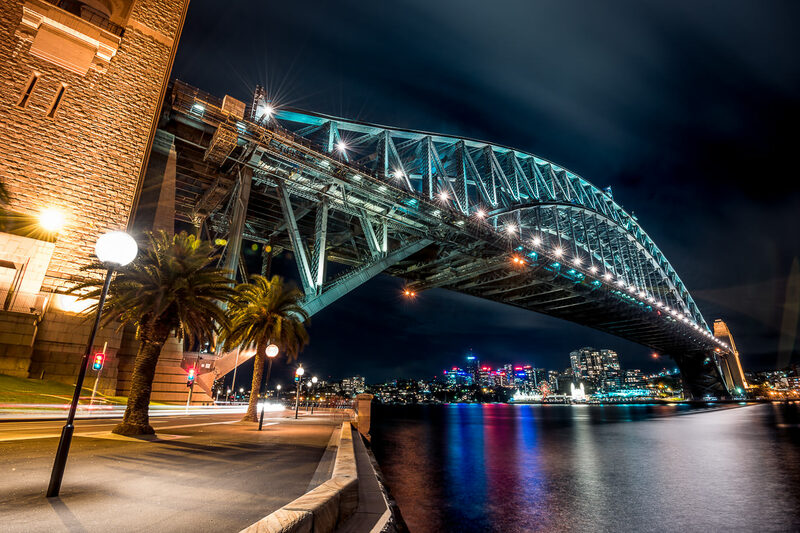 Wide angle lenses are best for capturing the skyline and Harbour Bridge. You’ll probably want at least a standard zoom for the Opera House. This would be a fantastic vantage point for watching the famous Sydney New Year’s Eve fireworks, but you’d have to arrive very, very early. When shooting on a tripod at night, use base ISO to reduce noise and long exposures to soak up all the city light. Because the location is surrounded by water, you can smooth out the water by doing super-long exposures (longer than the 30 seconds your camera will allow) by shooting in blub mode. You’ll have to calculate a proper exposure yourself though! Be careful not to blow out the whites on the Opera House! Take a few exposures and combine them in Photoshop if necessary. Lights of passing ferry boats can add an interesting touch to long exposure compositions. Watch out for them!